Akinyi Princess of K’Orinda-Yimbo was born on the shores of Lake Victoria in Kisumu, the capital city of Luoland, Kenya; at a very young age (when she was too small to say “sod off!” as she puts it), she was sent to private school in Yorkshire, England. She is a graduate journalist of the Nairobi and the London Schools of Journalism as well as an economics graduate of the London School of Economics (1981-1987). She moved to Bavaria, Germany, where she studied Germanistics and Germanspecific economics (1993 to 1997). 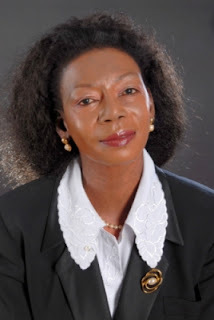 She has been writing as a freelance journalist since 1980, serving as a columnist with various dailies and monthly magazines in Africa and Europe. She gives lectures and seminars in various German universities, colleges and high schools on topics ranging from socio-economy in Africa, Business English, Intercultural Communication, African literature and the socio-ethnological conflicts in the traditions of Africans and Europeans in particular, and the West in general. In 2012, she got her Doctor of Philosophy In Sociology and Geo-Politics from the Heidelberg University. She was the CEO of her companies Eur-AfrAsia Association for Quality Management & Intercultural Communications Training, and PAKY Investment Holdings Ltd. She gave up both posts in order to devote her time to her passion: writing. She is now only Chairman on the Board of Directors. She has written and published articles, papers, and a novel in German: Khiras Traum, and five novels,Bound to Tradition: The Dream; Bound to Tradition: The Initiation; Bound to Tradition: The Separation; Secret Shades Book 1: Aroused; Secret Shades Book 2: Revealed.. 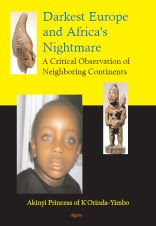 Her nonfiction book Darkest Europe and Africa’s Nightmare: A crtical Observation of Neighboring Continents was published in 2008 by a New York publisher. She is also a columnist with The African Times (Times Media, Berlin). In 2010 her short story, The Proposal, won the Cook Communications first prize. In 2012 she won the Karl Ziegler Prize for her commitment to bring African culture to the Western society in various papers, theses and lectures. In 2012 her book was nominated for the 2012 Caine Prize, and in 2013 she was shortlisted for the Commonwealth Writers Prize. In addition she won the Achievers Award for African Writer of The Year 2013 in the Netherlands. In 2014 she started the publishing company, AuthorMePro Press, to assist aspiring writers – especially from the developing world – to get published. She speaks seven languages, is married to a German politician of aristocratic descent, has a son, two grandsons, and lives in Bavaria. They also have homes in France, Cyprus and Greece. If the United States is based on the principle that all men are created equal, why, the author asks, does the West treat Africa and Africans differently? Just what kind of democracy is being exported, when only the West’s interests are served? In an incisive view of the relationship between Africa and the West, a London-educated Kenyan princess suggests that the aid machinery hurts Africa more than it assists. Westerners (and successful Africans alike) perpetuate the negative image of Africa to assuage their consciences as they continue to rip off a rich continent, while deploring the poverty they themselves help to keep in place. Probing the human causes of Africa’s continuing travails, the author examines the result of official policies that were sold to the public as “aid programs,” while poking fun at Western hypocrisy and greed, and African vanity and passivity, as well. Western citizenry have been schooled to think that their countries are wealthy because they are smarter or work harder – a belief fostered to support hegemonic delusions. Just as artificial, she argues, is the notion that Africa’s alleged poverty and the West’s staggering economic and military might could be related to skin color or the scientifically preposterous notion of “race.” The truth, the author maintains, is that they are rich because they have robbed and still rob their wealth from the rest of the world, creating “poor countries” precisely where the greatest natural wealth is found. American and European corporations, and now Chinese as well, whisk away Africa’s resources to enrich their own economies and peoples. The author looks at contemporary political, humanitarian and economic trends, assessing the World Bank, WTO, G8 and the IMF to be the long arms of the world oligarchies, primarily the USA. She considers NGOs a menace to Africa while serving as a job-creation blessing to the rich nations. She suggests the aid industry does more harm than good, dissuading Africans from defending their turf while foreign corporations scoop up all the resources. At the same time, the author equally reprimands not only the predator politicians and elite of the African continent but all Africans for their passive resignation to a fate they can change through affirmative actions. Previous Previous post: Sylvia Williams Greene, is an 80 year old mover and shaker, activist, artist, and leader in the Freedman (predominantly African-American neighbourhood) of Lenoir, North Carolina.